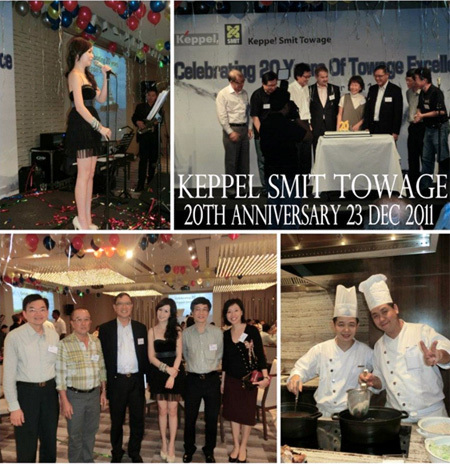 Keppel Smit Towage had held its 20th Anniversary celebrations at Grand Hyatt Hotel, Singapore on the 23-December 2011. We would like to send our deepest appreciation and gratitude for your excellent performance that was much talked about by all our guests that night. Our Keppel Group Corporate Communications team were very impressed with the lovely vocals and mesmerizing music being played and I'm certain that we will be seeing more of your wonderful performances for future events. I would like to take this opportunity, on the behalf of the management of Keppel Smit Towage and the organizing committee, to sincerely thank you & your team for extending to us what will now be known as a memorable and excellent performance rendered and exceeded. You would be glad to know that our first choice for future events need not be mentioned. Wishing you and your team a Happy New Year." Snr. Marine Operations Executive "
"Hi Lorraine and Wedding Harmony! You guys were awesome that night. 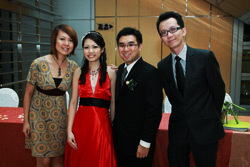 Thanks for making our wedding so memorable and everyone had fun thru out the dinner! 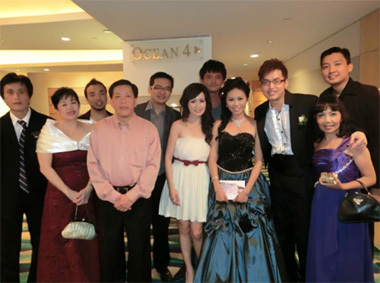 Cheerios - Derrence & Grace Chan"
Thank you very much and congratulation for a great performance at our wedding day on 9 December 2011 at Carlton Hotel. Happy to share that we received great feedback and praises from our guests for your excellent performance. Once again, thank you for making our wedding night a memorable one. We wish you happiness and continued success. My Guests are also very impressed by the Live Band & Music Quality. Even guests who I know are very critical and complained of lousy live band music at other friend�s wedding enjoyed your performance. The sound from Wedding Harmony is really unbeatable. It is clear and beautiful, creating a loving atmosphere, yet not overwhelming. No amount of words can express my gratitude. Best wishes for you career & future endeavors!" 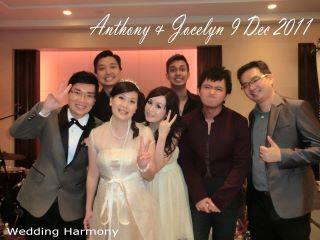 "It's our honor and pleasure to have wedding harmony to support us for the wedding. 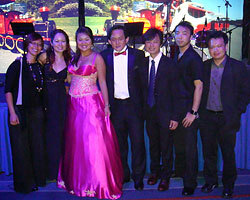 Both myself and Jess and all our guests have enjoyed ourselves with the amazing performance by Lorraine and the team. All our guests gave great compliments and thumbs up comment for wedding harmony especially with Lorraine beautiful voice. There are further enquiries on engaging Lorraine and team for their wedding and events. 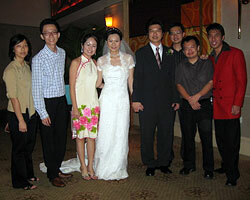 In short, Wedding Harmony has been a great factor for our wedding to be a successful one. Once again, we like to thank you guys for bringing us wonderful and enjoyable entertainment for our celebration of love. And Lorraine, thank you for helping me to calm my nerve down for my speech. It really helped. From the bottom of our hearts, myself and Jess like to thank you your team for letting everyone of us enjoy the night!" We love you all! Cheers! "Thanks Lorraine and Eric for the wonderful march-in songs. Initially, when I pick this song 'the prayer' and 'I believe in you', I thought you will call me to change another song.... But amazingly you made it with your wonderful voice! 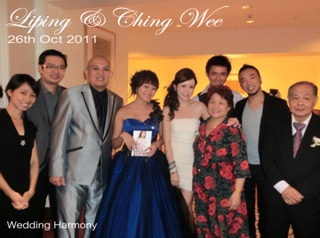 Ching Wee & myself really appreciated it and all our guests enjoyed the songs that you have brought for them! 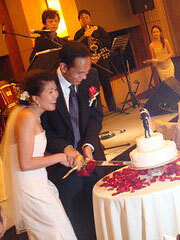 We made the right choice with no regrets by choosing wedding harmony for our wedding. 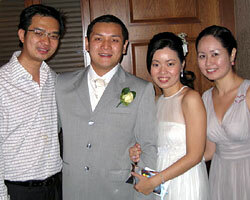 Below is one guest who commented on Liping and Ching Wee wedding. Thanks for a most delightful evening at the Wedding last night. I was most impressed with your professionalism and teamwork. Eric's high range was most enjoyable, and Lorraine proved to be the consummate professional. Thanks again! Dear Lorraine, Thanks for a most delightful evening at the Wedding last night. You are very talented, and your hard work and commitment have certainly shone through. Keep at it - you're certainly doing it right ! I am most impressed. Warm regards, Loo Choon Hiaw"
"Hi Wee Lee! 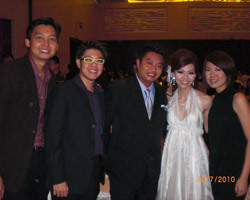 Rachel here from last Fri's Wedding @ Marina Mandarin. Thanks for all your help. Both Lorraine and Wayne and the Band was awesome as usual and our guests, family + Darren and I enjoyed ourselves with the Band very much! Many of us couldn't help but to sing along =) "
We wish to express our heartfelt appreciation for the beautiful performance yesterday! The performance was awesome and acoustics were splendid. 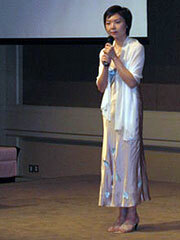 Our guest praised that many of songs crooned by Phoebee were very nice. Special mention to Joel who kindly helped us to weave our special requested medley together, meeting up with us for rehearsal and was accurate to the seconds matching the montage screening even without a full dry run together! Thanks to the saxophonist who added in the accompaniment. 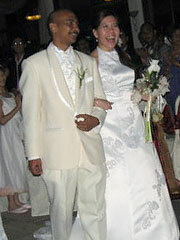 "We would like to express our gratitude and thank you for what your team has given us, a wonderful wedding night. The music was fantastic and the atmosphere is simply brilliant. Wedding Harmony has given us a magical wedding evening which is above my expectation. Once again, Thank you for everything all of you have done for us that evening." Please send my thanks to the team, especially Lorraine, as the audience really enjoyed her singing that night." 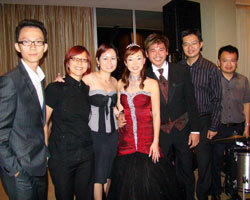 "We would like to thank everyone at Wedding Harmony for the wonderful performance. Your lovely music and sweet voices definitely lit up our wedding celebration. Our guests were full of praises for you (especially Lorraine) and they enjoyed the performance very much. You truly made our evening unique and magical and we would recommend all marrying couples to have you on their "BIG DAY" as it wouldn't be complete without you." 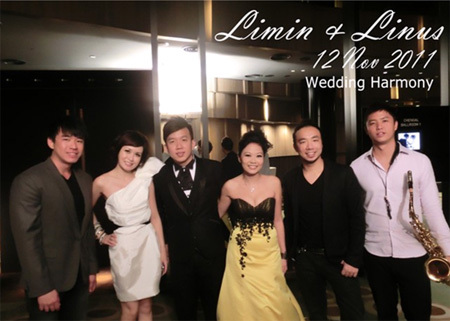 Thank you for the great performance on our wedding on 20 March 2010 @ Pan Pacific. Our guest enjoyed the music throughout the night. I had attached the photo taken that night for your keeping. 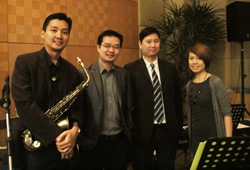 The 4 piece jazz band performed for our guests on the 13th March 2010. Rave reviews were received from our friends and family and some even commented on our facebook that the wedding lunch music lifted their spirits after a tired week of work and truely made it a weekend to remember. 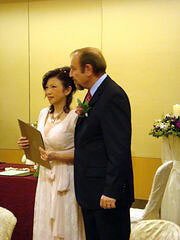 Keep up the great work and may more couples have your music to complete their wedding in times ahead. 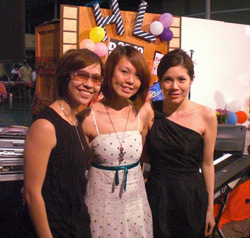 P.S: thanks for the support during the spontaneous duet by me and my wife during the event. My wife and I want to thank you for the wonderful experience during our wedding night! The quality of the singing and the MC is outstanding. We received many positive feedback from the guests. "On behalf of Heng Long, we would like to thank you for your great performance! We hope to engage you for your services the next opportunity we have. Thank you once again. "Thanks for making my dream wedding come true with the composition and arrangement of a truly beautiful and touching original wedding love song that Del and I can call our own. Del was so touched when I sang the song live to him that he teared and all our guests were equally touched and loved the song and montage so much that some were even asking for a copy to keep! ;) A pity the both of you were unable to attend our wedding dinner. I'm glad I made the decision to engage Wedding Harmony to create something so special that we'll keep in our hearts for the rest of our life. Do carry on with your passion for music and keep up the fantastic work that the both of you are creating. Seeya soon! PS: I'll be awaiting your next album release. ;p"
"We Wanna say a big THANK YOU to Stephen (Saxophonist), Gillian (Female vocalist), Joel (Keyboardist) and Wayne (Male Vocalist & Guitarist)! 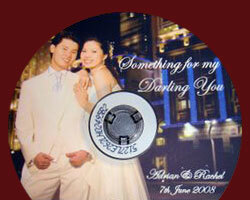 You have certainly made a difference to our wedding with your great music and singing." "The music group is fantastic. All of us like your musicians very much." 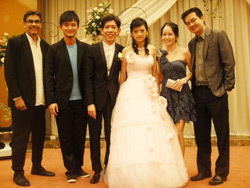 Chum and I would really want to thank you and Shaowen for providing great entertainment to our wedding on monday. It was a pleasure to experience how the usual chinese sit down dinner can turn into an ear soothing night filled with great music. Most of my guests enjoyed themselves and some even asked me if you guys are my friends as the performances seems natural and heart warming. Will send you a picture soon! And Wayne did a good job by presenting the wonderful violin pieces on our special night. Well, good job done! 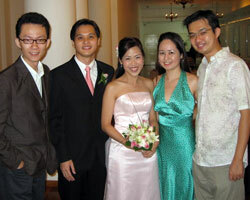 I would definitely recommend your service to my friends who are getting married in the near future." 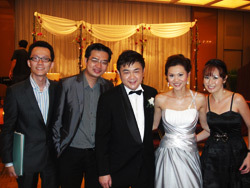 "Thanks Shaowen and Lorraine for your efforts to make the wedding of Albert and Candy a terrific success! The guests were all praise of the music =)"
"Thank you very much for your team and crew for the performance yesterday, most of our guests (I should say 99.9%) compliment on your performance, we were proud of engaging your team for our ceremony yesterday. Look forward for next year event, we wish to have a grand one. Thank you." "On behalf of our company, we would like thank you very much for your contribution to our Annual Dinner & Dance on the 12th December 2008. The music was excellent with many of those attending mentioning how great it was. Once again, thank you for assisting to make the dinner a highly successful event, and making the night a truly fun event." "Thank you very much for the wonderful performance. I am sorry that I did not have the time to talk to you all. The music was fantastic, especially the add-on for the saxophone. 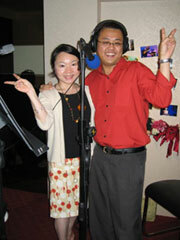 My guests loved the songs very much. One of my friends said that it's the first time she actually liked the song "Lao Shu Ai Da Mi". You did a great rendition of that song. I am also very happy that my teacher was performing that night. He's marvellous. I would like to thank Simon too. The Yam Seng session would never be better and so organised without him." "We have returned to Taipei a week ago and its back to work. A note to convey our sincere appreciation for making the evening a special one. 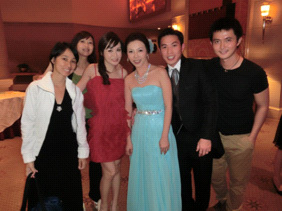 My friends said Lorraine sang very well and they were surprised that she could sing Chinese songs so well too. Everyone enjoyed the evening very much and thought this was one of their more enjoyable and romantic weddings they have attended. Thanks a lot." "We would like to thank you once again. Your music undeniably lit up our wedding celebration. Our guests enjoyed your performance very much. 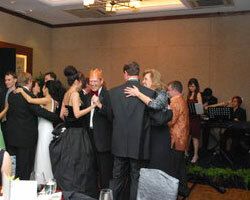 Hearing our favourite songs made the night more memorable to us and our guests. 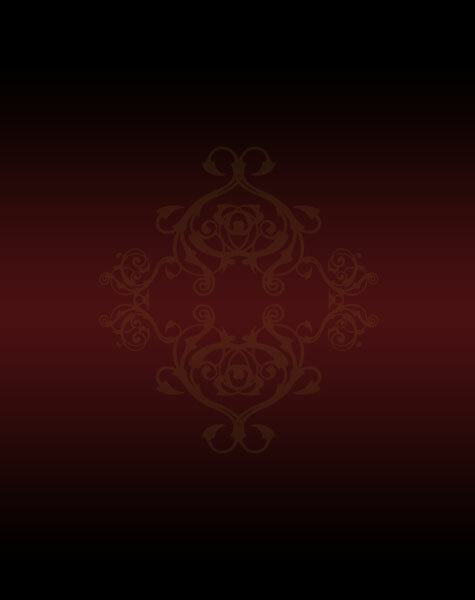 We are also happy to see excerpts of our wedding in your website. Thanks for the nice compliments." The original you guys put together is simply.. (lost for words le).. I was tearing when it was being played.. I'm sure you all were looking at me..
Love you guys!! And keep in touch k.. *hugs*"
"In the initial part when I decided on getting a song written for my darling, I thought there should be alot of meetings, and emails flying around to get Lorraine and Shaowen understand the relationship Rachel and I shared. But suprisingly enough, all I ever asked to give were messages or anything that shows my feelings for Rachel for the past 12 yrs. I must say that I very impressed with both Shaowen and Lorraine, as only with those simple messages and writings, they can churn out the song, which I like almost immediately when I first heard it! The song totally represent me and my words I want to tell my darling. Once again, I would like to thank both of them for the great work done, and thanks for making this so memorable for both of us!" "Thank you so much for the delightful music! The songs were exactly what Fiona wanted, smooth, soft and sweet... Exactly how she imagined. Our parents and siblings all loved the performance, especially our guests from Korea. Thank you so much! 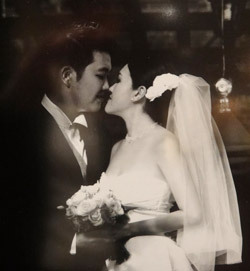 :)"
"We would like to thank Wedding Harmony's staff, especially Lorraine and Lizhang for making our Wedding night such a romantic and memorable one! Lorraine is very professional and extremely friendly and helpful. She is always all smiles whenever there are queries from us. And for the fact that we did not rehearse for the march-in (which many couples do), I was quite nervous about it, but Lorraine reassured us that everything will be fine, just walk slowly and smile..and true enough, this experience was simply fantastic.. with Lizhang and Lorraines' voices serenading the ballroom, it was really beautiful & Touching! (Thanks to Lorraine for choosing the 2 beautiful March-In songs). So many friends gave 'Thumbs Ups' for Wedding Harmony! Thank you ALL once again! "Thank you for the great live music! I have mentioned that to shaowen yesterday when we chatted, but i would like to personally thank you for your beautiful voice and the great music produced by your band - absolutely beautiful and professional!! everyone only has only praises about you and the team. and most importantly everyone enjoyed the music - it really made a hugeeee difference on the overall atmosphere. I will see u both again in february for titin's wedding. once again, thank you, and pls do buzz me when both of you are visiting bangkok." "We just want to express our thanks to you & the members of The Wedding Harmony for making our Wedding Celebration a most enjoyable one. 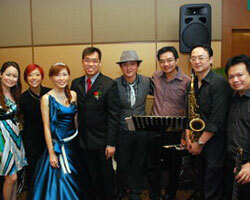 Everyone of our guests paid compliments to The Wedding Harmony for your brilliant performance. Praises ranged from "excellent selection of music" to "such lovely people" to "the perfect complement for a wedding". You indeed made Our Wedding a very special one. There couldnt have been a better choice than The Wedding Harmony." "Thanks Lorraine and Shaowen for your generous compliments :) We are so glad that we remembered our lyrics hehehe ... Thank you for assuring and encouraging us all these while especially during the actual day rehearsal when I was so nervous and panicky. James and myself would like to thank Shaowen, Lorraine and team for a great job done on our big day. The walk-in song "Somewhere over the rainbow" sang by Lorraine was so beautiful and it creates the exact atmosphere that I wanted. The song written for us was simply touching!Despite me giving Lorraine short and simple lyrics, she managed to transform it to such a beautiful and heartfelt song! Thanks for your patience towards James and myself during the 1.5 years of preparation. 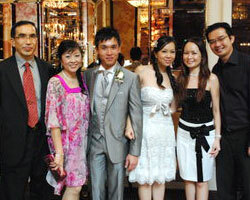 Lorraine and Shaowen are very easy-going and understood what we want for our special day even from the first meeting! Very talented couple and team. Thanks for making us wedding even more beautiful with your music and voices. We have received many compliments from the guests :) They really enjoyed themselves! Will send you more photos of your wonderful team that night :) Do keep in touch ok?." "Thank you for the wonderful and fantastic performance. Received many good feedbacks and enquires on who you people are. It was really a great night. The songs are wonderful too. We like the songs that you have written for us. Even both parents like the songs too. I can see that my mum nearly cried (with happiness) when she heard the song. Though both of us are running around, we really enjoyed the songs that were sang. You have left us with wonderful memories of the night. Thanks again for the good performance and the 2 songs that you have written :)"
"Thank you for playing the accompaniment for me in Ailing's wedding...this is my first time singing in front of such a big crowd and with live band...on top of feeling honored to sing in my best friend's wedding, this experience will be an unforgettable one for me. I would also like to compliment the whole team of Wedding Harmony for doing such a great job in Ailing's wedding...Lorraine and Lizhang both sang beautifully and the musicians were wonderful...I really enjoy the music! If you have any public performances, do keep me in the loop as I would love to have a chance to watch you guys perform again!" 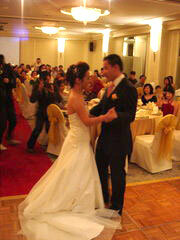 "Thanks for the great performance on our wedding banquet. The feedbacks were great from our friends and relatives, they have been asking us who you guys are and how we got to know about you. Although we both were busy running around but we heard all the songs and we love it very much. Especially the song that you wrote for us (The One In My Life) for the wedding montage, most of our guests cried and were touched by it. Of course we both cried as well and we love the song so much that we actually downloaded it to our mobile phone. Thanks for everything and you guys had made the most beautiful and memorable memories for both of us. 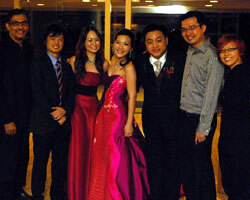 If any of our friends had any events, we will definately recommend The Wedding Harmony." "... first of all , we both wd like to thank u guys frm the btm of our hearts for a perfect wedding evening atmosphere ... your music and set up that you created was just so apt ... it was worth much more than (what was paid for the) written package ... the tribute song that you composed brought tears to many of us ... we are truly grateful and will not forget the beautiful memories that u guys created ... thank you once again!" "One of the loveliest couples we have ever met, Lorraine & Shaowen are so easy to talk to, it's almost like catching up with old friends. They take a genuine interest in our love story and have great passion in what they do. They will go far in this business." "We really were impressed by Shaowen and Lorraine when they managed to compose a song to suit Our wedding theme which was celtic and mysterious. Really thank them for the beautiful song." "It is really magical to see our thoughts and feelings for each other being composed into a song. Wonderful job by Wedding Harmony for the original concept!" "The idea of producing our own wedding song is really unique and exciting. This song has transformed our wedding into a really memorable occasion. Through this song, future generations are able to learn more about our love story. Here is a Big Thank You to Wedding Harmony and all crew members for marking our occasion with such a spectacular production! =)"
"Every wedding is special, and every wedding has its own story. Ours was told from a series of letters and messages from our courtship days, captured in a song written by Shao Wen & Lorraine. We want to sincerely thank both of them for sharing their great love of music with us, for blessing and touching us on our special day with an unforgettable gift." 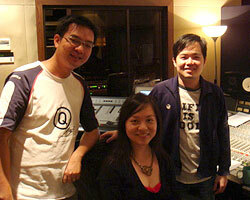 "We thought it was an unreasonable request, asking for a chinese / cantonese feel in our song. But within a couple of weeks, they composed one that really matched what we wanted. The more we listened to it, the more we liked it. They're fun and friendly people to work with, making the planning process stress-free. 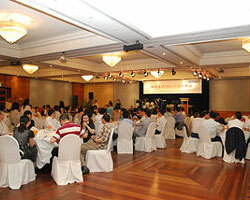 Oh, and they're ever ready to give you memorable surprises during the event too!" wedding even more memorable and romantic. I can still remember walking down the aisle to the tune of "If" ... it was perfect and just as I had wanted it. Our guests really enjoyed the music too, even the "older" crowd (our relatives) appreciated the music which was a lovely backdrop to the ongoings of the wedding luncheon and dinner. Kudos to the two of you, (and the other singer for the night whose name I can't remember!) for being so nice and accommodating throughout. It was lovely working with the 2 of you. We owe you one for making our wedding special." "Lorraine and Shaowen, the harmony of your melodious voice and talented fingers really swept our guests off their feet that night. It was the perfect way to bring across our love story and you truly made our evening unique and magical. Thank you!